This past weekend, we flew to Pasadena. That sounds rather blithe, but this family reunion to honor my late mother-in-law had been planned for over a year. 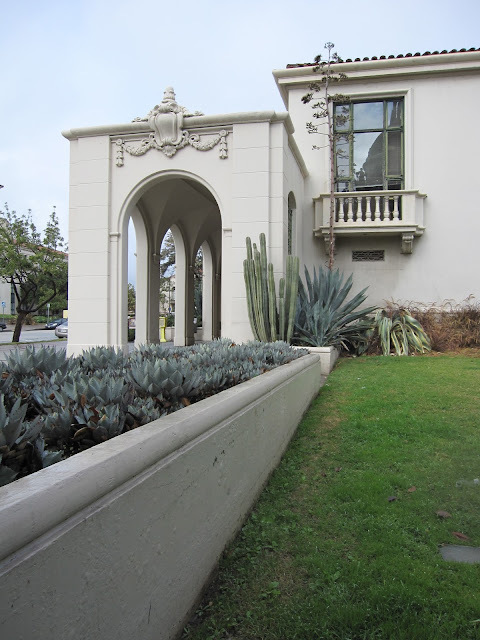 I'll be posting about other parts of the weekend, but I'm beginning in reverse with our last day: Monday was very wet and our plans to visit the Huntington Gardens were ditched in favor of exploring some public buildings in Pasadena. The Mulch Man was interested in finding out more about any structural damage from a freak high wind event that happened there in November and arranged to talk to a City of Pasadena building official. 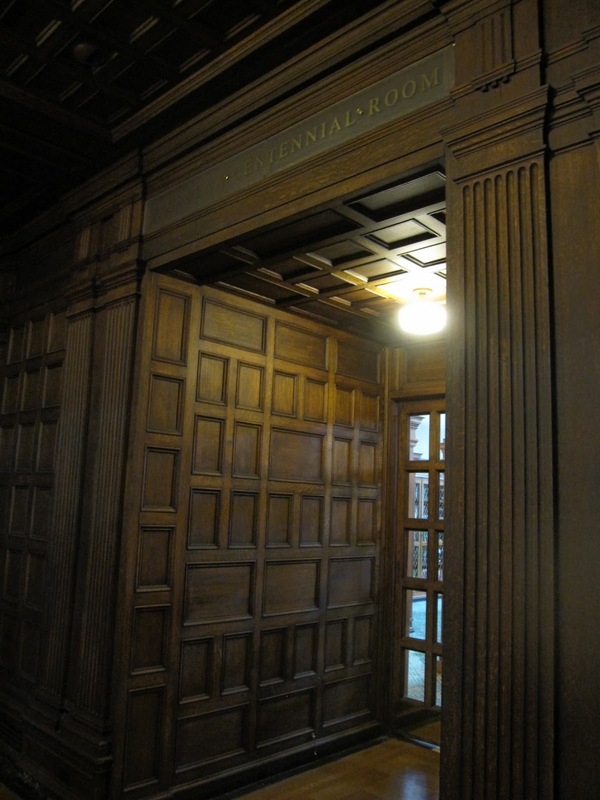 Afterward we wandered over to the main building of the Pasadena Library. The lovely old building was somewhat marred by this unattractive orange mesh, apparently protecting people from falling into the ongoing fountain repair project. The main Pasadena library has a feel something like the downtown Portland main library, and it's probably about the same age. Inside, along with a wonderful children's library, we found the Pasadena Centennial Room, a reference room devoted to publications specific to California and Pasadena. 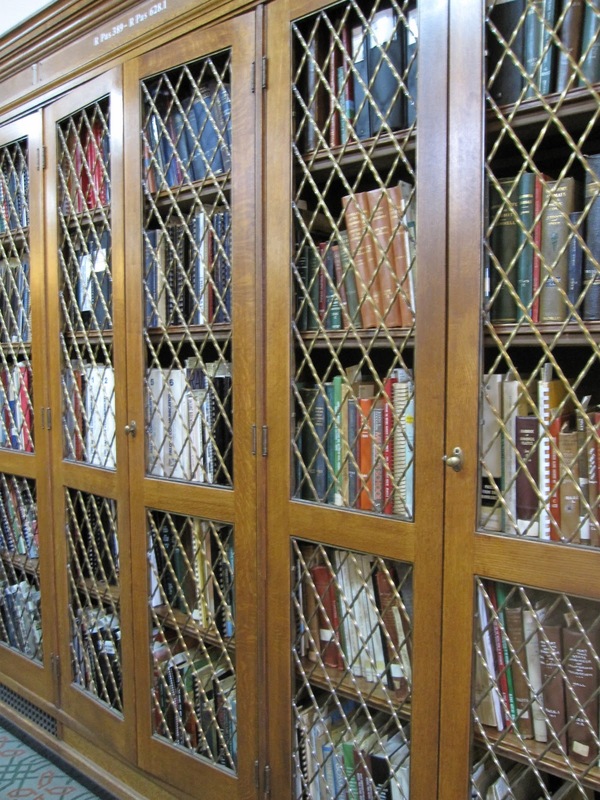 Of course, I made a beeline for the horticulture books. That tiny field guide in the center is from 1911. It had some beautiful drawings, but I wasn't permitted to photograph them. 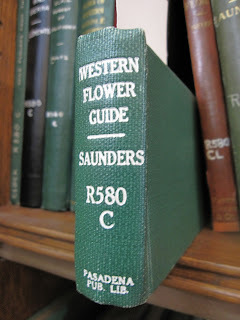 There were other great titles: I was surprised to read about the large number of Opuntia species endemic to Southern California in California Cactus. 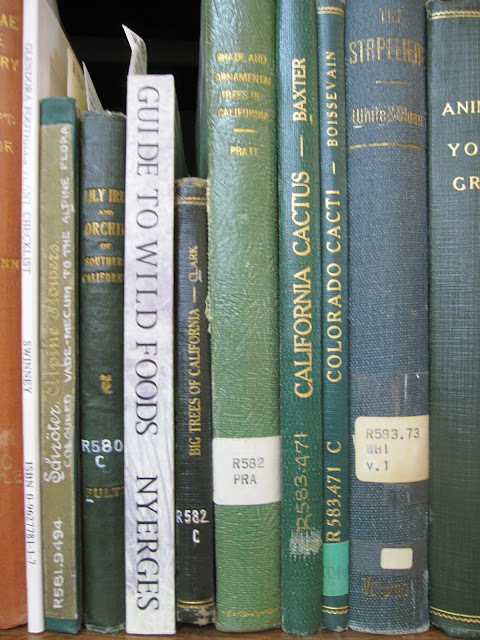 The Mulch Man discovered a book on wild food by an old school friend, Chris Nyerges, in the collection. And I didn't even get inside Big Trees of California. The large room was full of readers, but I wasn't allowed to photograph people, either, so these shots are necessarily limited. 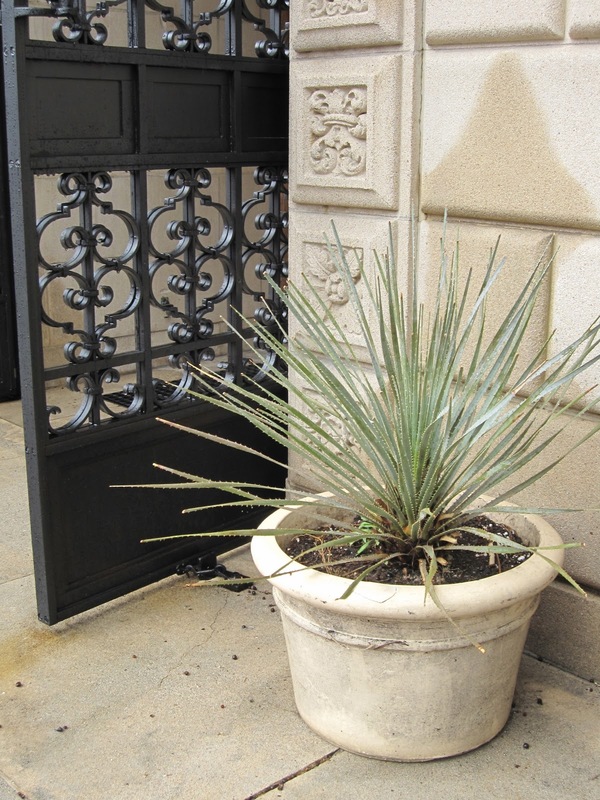 Leaving the library through the courtyard, I enjoyed the potted plants (Dasylirion?) 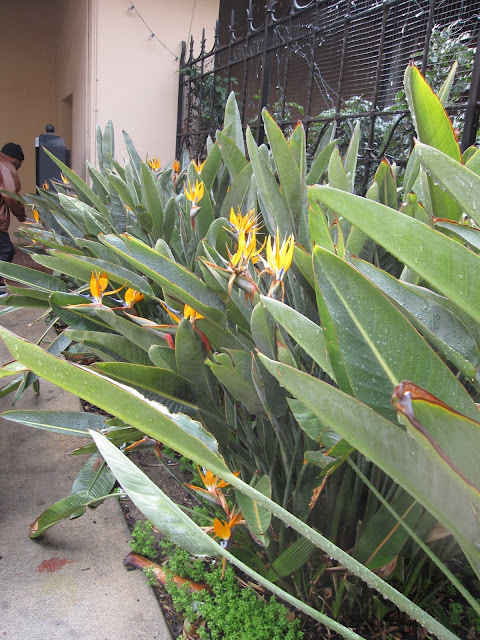 and a big planting of the irrepressible Bird of Paradise. Across from the library was a bed of Agave attenuata, one plant of which had a huge, arching bloom. As we walked back toward the car, we saw what I assumed to be evidence of the wind damage from November. 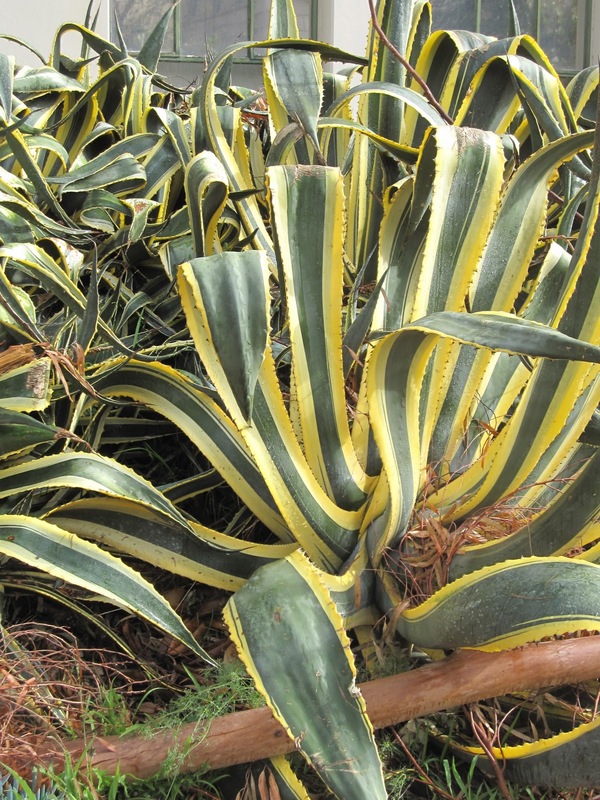 The bloom stalk on this Agave americana (variegata?) was broken, although its companion's was intact. Maybe the second one came up after the windstorm. Further down the street, branches that had fallen out of trees were still languishing over the plantings. The size of these plantings is hard to tell from my pictures, but some of the Agave americana were over eight feet high. I just love the huge, ropey arms on these big guys. And here's a lovely couple. I'm guessing from the the empty bottle in the picture below and the weedy, messy state of most of the beds that the City of Pasadena is dealing with some of the same economic issues that Portland is experiencing. Maintenance certainly appeared to be taking a back seat to other priorities. 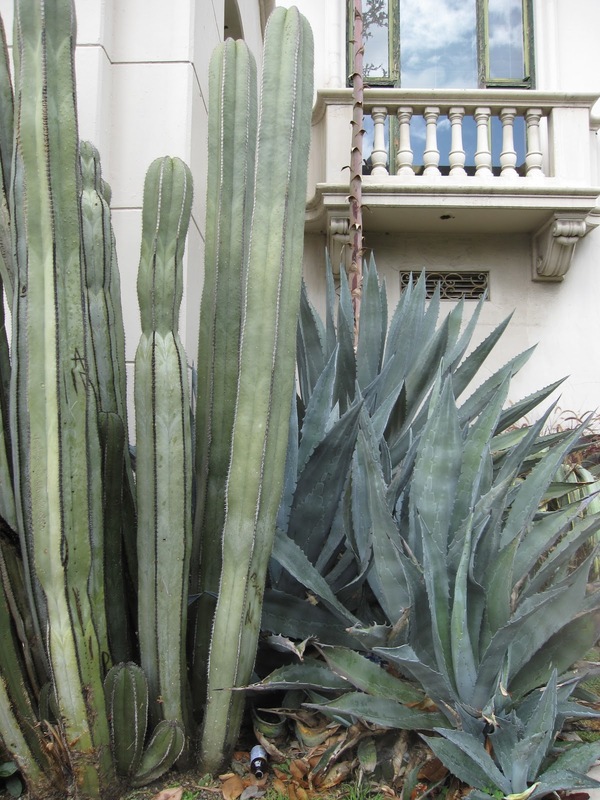 The view back to the happy twosome along the Agave truncata planter. That's quite a bloom stalk that Agave americana is sporting. 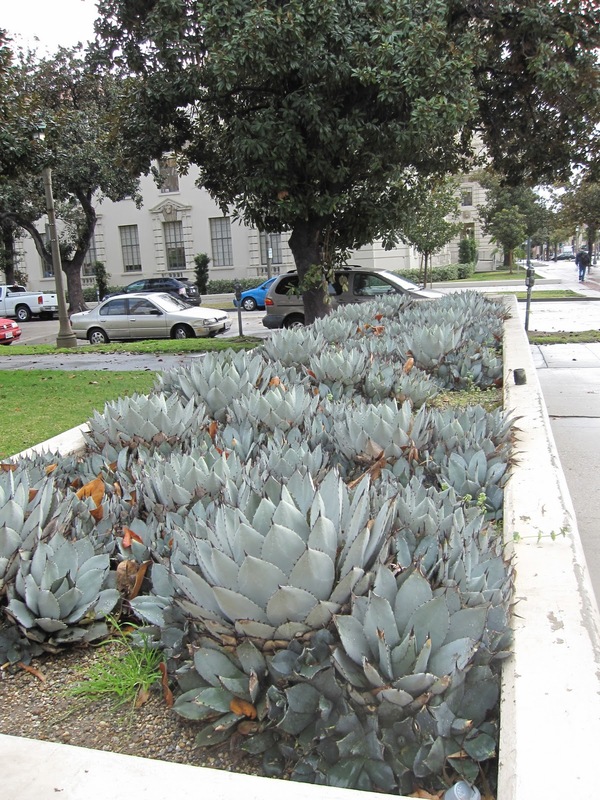 Check out this planter full of aloes! Some were blooming, oblivious to the wet weather. Do want! I think that gorgeous orange is a dead ringer for Tangerine Tango, Pantone's recently announced Color of the Year for 2012. It's certainly my idea of perfection. Now I know why architects must calculate the weight of snow on roofs in cold climates. My garden is showing the effects of just one night of wet snow, and it's already melted, not 24 hours later. 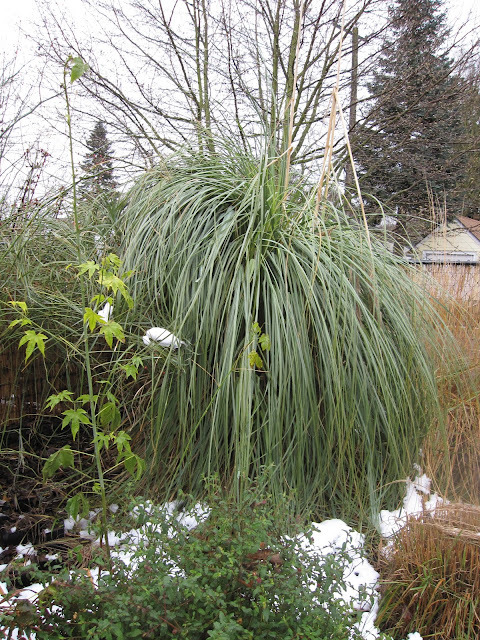 The Pampas plumes are broken and the plant is smoothed down like a beehive hairdo. The Eucalyptus pauciflora ssp. debeuzevilli was already listing. Now it's leaning seriously and I'm wondering what intervention, if any, would help. Plants all over the garden are broken and battered. The worst damage I've found was sustained by the center plant of the three 'Winter's Snowman' camellias I just posted about for Bloom Day. The leader has ripped apart from the middle of the plant. At least my grandchildren had some fun with the snow! 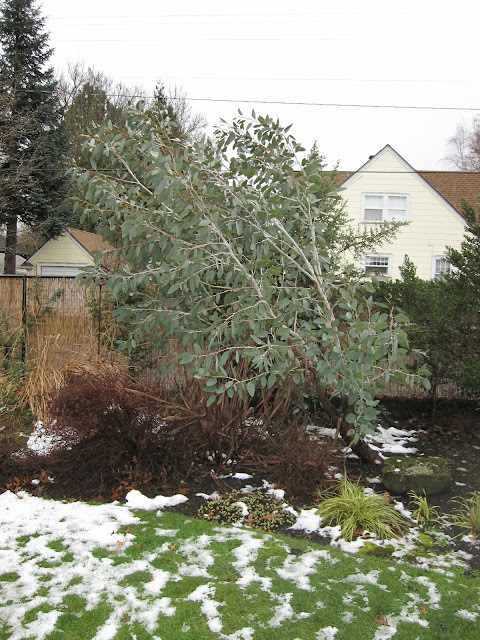 Did your Portland area garden survive this snow event better than mine? In December I had a brief post about the only two plants blooming in my garden. This month's post is briefer still, species-wise (although I got excited and took more pictures.) 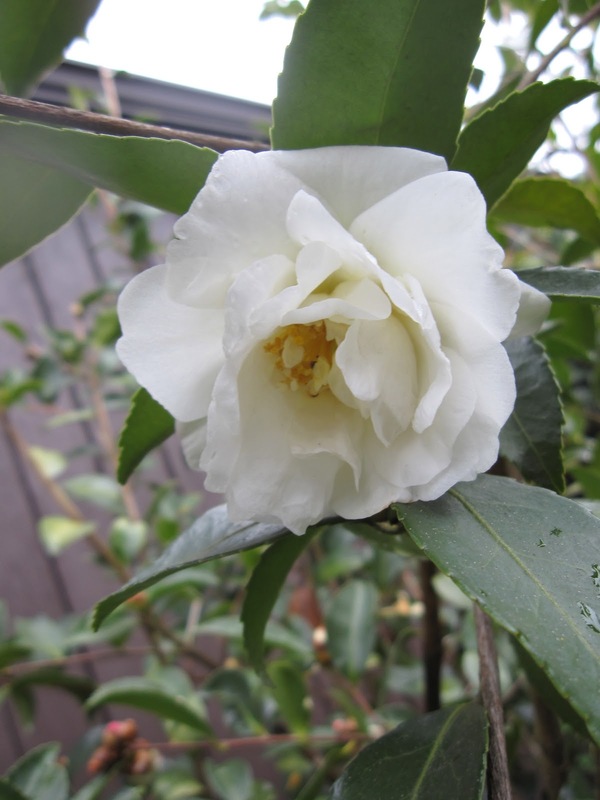 My solitary garden blooms this Garden Blogger's Bloom Day are on three Camellia x 'Winter's Snowman'. 'Winter's Snowman' blooms so early that the flowers often get damaged by winter's wet weather. Some years the blooms have looked rather depressingly like little blobs of wet tissue stuck all over the plant. This year has been relatively dry, and the blossoms are lasting longer and looking much prettier. 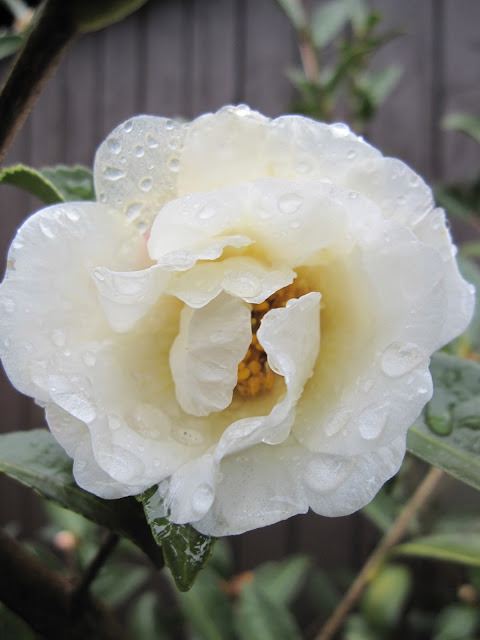 I mentioned in an earlier post about this particular camellia's open structure and the fact that we are not overwhelmed by their ability to create privacy for us. The way they are performing so far this winter though, I'm quite prepared to enjoy them as the stars of my garden this Garden Blogger's Bloom Day. The soft blush of pink on the opening buds is a delightful surprise up close. Pop on over to May Dreams Gardens to see what's blooming in other gardens this January. There's always something there to enjoy!